The primary purpose of Discover Diabetes Endocrinology and Metabolism is to act as a source of information for healthcare providers and researchers in basic sciences and technology who are in the field of Diabetes Mellitus. While our primary aim is to assist the practitioner in his/her care of patients with Diabetes, and to provide information that may allow the prevention of diabetes complications, it is our wish to function as a forum for that information which, while still experimental, may shed light upon current thinking of those active in the fields appropriate to the aims of Discover Diabetes Endocrinology and Metabolism. In addition to general articles on clinical aspects of diabetes mellitus, Discover Diabetes Endocrinology and Metabolism also presents articles on basic research and technology in all areas of diabetes and its related syndromes. Topics covered relevant to the diabetic patient will include diagnosis, pathogenesis, and clinical management of the following: diabetic retinopathy, neuropathy and nephropathy; peripheral vascular disease and coronary heart disease; gastrointestinal disorders, renal failure and impotence; and hypertension and hyperlipidemia. Discover Diabetes Endocrinology and Metabolism will also publish papers on the general pathogenesis and prevention of diabetes. 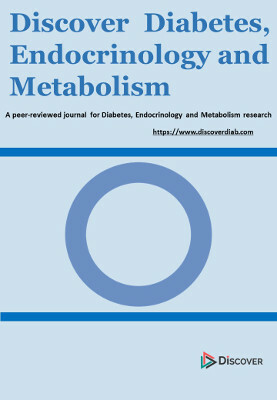 The articles in Discover Diabetes Endocrinology and Metabolism are open access articles licensed under the terms of the Creative Commons Attribution Non-Commercial License (http://creativecommons.org/licenses/by-nc-sa/3.0/) which permits unrestricted, non-commercial use, distribution and reproduction in any medium, provided the work is properly cited. Copyright © 2019 Discover Diabetes Endocrinology and Metabolism All Rights Reserved. Subject to change without notice from or liability to Discover Diabetes Endocrinology and Metabolism . Discover Diabetes and Metabolism (DiscoverDiab) is published by Discover STM Publishers.